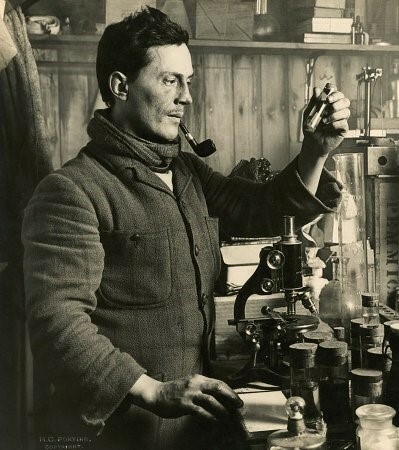 Atkinson was a Royal naval surgeon and a member of Scott's Terra Nova Expedition, 1910�. He was in command of the expedition's base at Cape Evans for much of 1912, and led the party which found the tent with the bodies of Scott, Bowers and Wilson. Atkinson was subsequently associated with two controversies: that relating to Scott's orders concerning the use of dogs, and that relating to the possible incidence of scurvy in the polar party. Atkinson was born when his family was in the Caribbean Islands "where he spent much of his childhood." He was educated in England and received his medical training at St Thomas's Hospital, London, "where he became the hospital's light heavyweight boxing champion." After qualifying as a medical doctor in 1906, in 1906 he joined the Royal Navy as a medical officer. Atkins returned to England and carried on with his naval carreer. He served in the First World War, with distinction, at Gallipoli and on the Western Front (was at the Battle of the Somme). Atkinson died suddenly while at sea, at the age of 47, and was buried at sea. Eight years later Cherry-Garrard wrote an extra preface to the 1937 edition of The Worst Journey : "His voice has been with me often since those days � that gruffish deep affectionate monosyllabic way he used to talk to you...he could not help the tenderness poking through. I am glad to have this opportunity to witness something of what we owe him."